The Hummingbird Bakery is the destination bakery for Londoners with a passion for great cakes. In this irresistible book, the chefs from the bakery share their recipes for a delicious range of 60 bakes, from deliciously light cupcakes with pretty buttercream frosting to moist chocolate layer cakes and zesty lemon meringue pie. 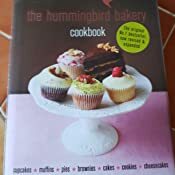 Hummingbird recipes not only taste great but also look spectacular - without resorting to fussy recipes and hours in the kitchen. 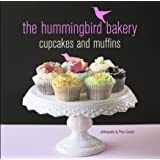 The chapters include Cupcakes, Cakes (including loaf, layer, ring and cheesecakes), Pies, Brownies and Bars, Muffins and Cookies. Find blenders, mixers, food processors and all the gadgets a budding chef needs in the Kenwood Store. 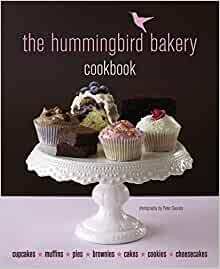 Start reading The Hummingbird Bakery Cookbook on your Kindle in under a minute. 5.0 out of 5 starsFull recipe list in review. Beautiful cupcakes and other delicious baked goods. . .
As a mad keen foodie - that's cooking and baking as well as stuffing my face! - I love love love coffee or tea and . . .cupcakes! I've been meaning to buy this recipe book for ages and now I've got it, I love it! You can google recipes all day long but it's definitely better to have it in a book, right infront of you! This isn't a big book but - it has a lot in it! 72 delicious cupcake - muffin - cookie - cake - pie and brownie concoctions. Very well presented - clear and concise and really easy to follow. 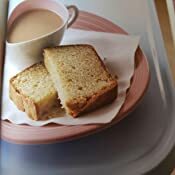 The recipes are accompanied by very nice photographs of how the finished masterpiece should look. But if it doesn't- if it's a bit wonky and all that, it'll still taste good so no worries! I've reviewed a lot of cookbooks on here and as ever - here Is the full recipe list as presented in the book! It bugs me that we're expected to buy a cook book without even knowing what's inside. If you're in a bookshop you can have a sneaky peek so - now you can here :) . . . Vanilla - Chocolate - Cream Cheese. Brownies and Bars. . . I've made a few upto now and anything cheesecake in here is good to go - as a violet gin lover the lavender cupcakes are the business and I must say I'm a huge fan of the black bottom and red velvet. Delicious. There's also a recipe in here for chocolate cola cake which I haven't made 'yet' but have tasted - omg! So, yup. Really nice book here which would make a nice christmas pressie for a budding baker. Another cracker to add to my kitchen bookshelf. 5.0 out of 5 starsNot sure what some are doing wrong! I've owned this book for a few years now and it's always my "go to" for cupcakes. They always turn out perfectly; soft, light and delicious. I tend to reduced the frosting amounts by half if I'm just spreading it on rather than piping as I find it a bit much otherwise! The double chocolate chip cookies are incredible and my toddler is a big fan of the savoury muffins which are ideal for keeping in the freezer and can be defrosted in the microwave on about 30 seconds. I find the cooking times to be accurate, but it's always worth buying a thermometer for your oven as that can account for some variations. I bake a lot and would definitely recommend this book. 3.0 out of 5 starstoo many errors!! 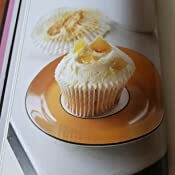 I've had this book a while and have made the cupcakes successfully and the frosting is lovely. I just felt I should warn buyers to beware of errors in the book. I have just made the lemon loaf (to take to a family party - oh dear!) - the amount of flour is 350g - not 560g as they specify - apparently there are other errors with the lemon and poppy seed cake and the red velvet - I did make the red velvet, but ised far less food colouring as it was swimming with the amount they specified - it turned out okay, but I think they are very wrong to not be issuing an errata page with all further books. Their blog skims over the mistakes, as if it is nothing - my cake took me all morning to prepare and is now in the bin - along with the book! I am furious (as you can tell!) - I now have to go and buy some shop made contribution to the party and just wish I had gone back to perfect Delia - my trusted friend (years of baking from her books - and not one thing wrong!) - get your act together Hummingbird - no excuse - you're supposed to be the expert bakers! This was mainly a photo opportunity cook book. 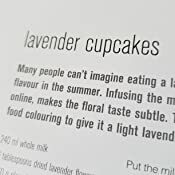 The first section was devoted to cupcakes, ie very little variety in the cake content and huge variations in fat and sugar filled toppings. Rather call it a topping collection which was closer to the truth. The rest of the recipes, which I read yesterday, are so bland as to have passed from my mind altogether. This would be a pleasant book to browse through in a waiting room. A great cookbook, well-illustrated throughout. If you want impressive but reasonably easy cake, pie, cheesecake and cookies/biscuits/flapjacks this is great. The recipes I tried worked out fine; delicious, but a bit too tempting if you're trying to cut down on sugar etc. Now I use it when visitors are coming! This book is excellent for a beginner with very easy to follow recipes. I baked the Lemon cupcakes twice, the Banana/pecan muffins and the moist Carrot cake which tasted amazing and got compliments from everyone. To get a healthier result I would suggest reducing the amount of frosting used per recipe otherwise you will end up with the dessert being super sweet.